This winter's El Niño could be one of the strongest in the past 50 years, leading to a return of meaningful but not necessarily drought-busting rain in California. "El Nino has steadily strengthened over the past month and is now approaching strong category strength," stated AccuWeather Senior Meteorologist Brett Anderson. El Nino occurs when ocean water temperatures rise above normal across the central and eastern Pacific, near the equator. "Latest long-term climate modeling is very aggressive in strengthening this El Niño to near-record levels," added AccuWeather Meteorologist Ben Noll. "The strongest El Niño on record since the beginning of the 20th century occurred during 1997-98," continued Anderson. California was the target of frequent storms during the winter of 1997-98 with February being the wettest month. February rainfall records were set in many locations from San Francisco southward with some communities registering all-time monthly rain records. February 1998 remains the wettest February on record in downtown Los Angeles with a total of 13.68 inches. That is slightly more rain than Los Angeles has registered since January 2014. The winter of 1997-98 also unleashed yards of snow in the Sierra Nevada, according to AccuWeather Senior Meteorologist Alex Sosnowski. 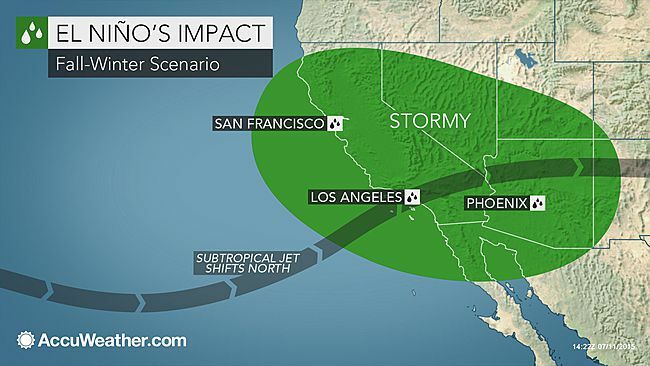 An El Niño typically leads to more storms targeting California since the jet stream and resultant storm track dips southward across the state and pulls in tropical moisture. 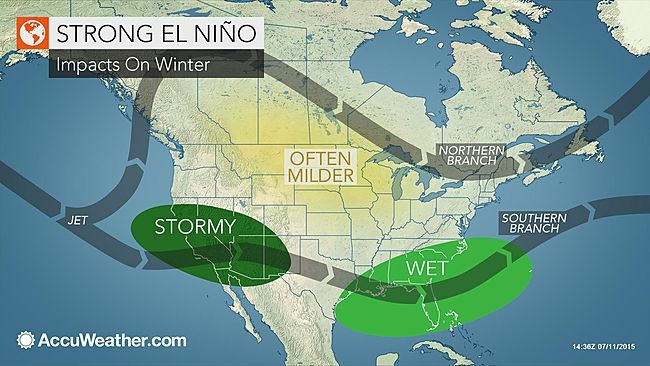 The stronger the El Niño, the farther to the south the jet stream will dip. As evident with the winter of 1997-98, "A strong El Niño could be good news for the extreme drought in California," Anderson continued. "Unfortunately, a sudden turn to a stormy winter could also result in dangerous mudslides and flash flooding for the state." Anderson also added, "Not all El Niños are the same and other natural climate phenomenon can also interact with El Niño, resulting in a wide variety of seasonal impacts across the globe." According to Noll, one such climate phenomenon that could prevent this winter from being a repeat of 1997-98 in California would be a strongly positive Pacific Decadal Oscillation (PDO), which refers to anomalously warm waters off the west coast of the United States. "We really have yet to see such a strong forecasted El Niño paired with such a strong PDO. The PDO could promote a ridge of high pressure over the West, especially the Northwest, for extended periods of time during the winter," stated Noll. "While rains in California this winter probably turn out at least normal, the strong PDO may have an influence on the overall pattern and prevent the highly anomalous rains that would typically occur in a super El Niño, such as 1997-98," Noll continued. Even if El Niño wins out over the strong PDO, AccuWeather Senior Meteorologist Bernie Rayno cautions that it will take more than one strong El Niño winter to bust the California drought. "Current rain deficits are way too large," stated Rayno. "Even if California receives the rain that fell in 1997-98, it will not come close to ending the long-term drought." Normal rainfall and snowfall would still be a welcome change for drought-stricken California. About 71 percent of the state remains in the midst of an extreme to exceptional drought, reported the United States Drought Monitor. On the other hand, Noll is concerned for the droughts in Washington and Oregon to persist through this coming fall and winter. "A strong El Niño would also favor a milder winter compared to normal across much of the northern United States and southern Canada, especially in the Northwest," Anderson added. Leading up to the winter, the warm waters associated with El Niño will keep the eastern Pacific active through hurricane season. As this tropical moisture is drawn northward, a wetter-than-normal monsoon season is expected to unfold.